The charges stem from an incident that occurred Saturday afternoon (May 11) at Macy’s Department Store in the Antelope Valley Mall. Detectives said Pomare disguised himself in women’s clothing, wearing a bra with gel pads and a dark shoulder-length wig, and then snuck into the bathroom at Macy’s with a miniature video camera concealed in a bag. Pomare allegedly slid the bag underneath stalls in order to secretly videotape women as they were using the toilet, detectives said. A woman spotted the setup and contacted store security. “Macy’s Department Store Security Officers were contacted by a customer who complained about a man in the woman’s restroom who was acting suspiciously,” Hudson said. The security officers reported the incident to a nearby deputy from Palmdale Sheriff’s Station, as Pomare scurried from the bathroom and out of the store, detectives said. A deputy was patrolling in the parking area of the Antelope Valley Mall when he saw a male exit the Macy’s Department Store matching the description that had been provided to him, Hudson said. Pomare ran from deputies, but he was nabbed minutes later hiding underneath a tractor trailer near the store’s loading dock, officials said. A purse was seized from Pomare, which contained a video camera, a mirror and a roll of duct tape, officials said. Pomare admitted to deleting some of the images while he was fleeing from deputies, however, his video camera still contained footage of a female sitting on the toilet using the bathroom, officials said. 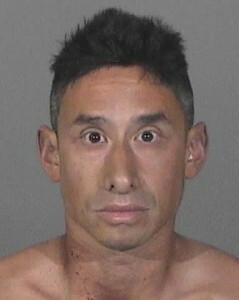 Pomare was arrested Saturday afternoon and booked at Palmdale Sheriff’s Station. The Los Angeles County District Attorney’s Office filed charges against Pomare on Tuesday. Anyone with information regarding this crime should contact the Los Angeles Sherriff’s Department Special Victims Bureau and speak with Sergeant Brian Hudson at 562-619-1370. UPDATE: After pleading not guilty to the charges on Tuesday, Pomare’s bail was set at $125,000, according to court records. Unable to make bail, Pomare was remanded to the Men’s Central Jail in Los Angeles. He is due back in court on June 6, for a preliminary hearing on the case. 25 comments for "Palmdale man arrested for videotaping in women’s bathroom"
The courts and Jerry Brown have decided that there is no room in the the prisons and jails for criminals so it’s a good thing that the community has room for all these guys doing little to no time in custody. Had to have made a very ugly woman!!!! hey guys, this dude caught a lot of heat about how he looked in high school too. he’s had it rough for his whole life..give him a break aight. No, not aight.Many of us have had a rough life and don’t go on to victimize others. A decent haircut might help. I work with this individual. He is weird and at the same time nobody could tell something is wrong with him. He’s a hard working guy and a good person in the work place but no one would ever imagine something like this. We are all in shock. DUi’s, Drug busts, Shootings, Stabbings, Finding human remains in the Desert now Peeping cross-dressers! We definitely have it all up here. Before I forget I have to mention, last but not least we also have funny public servants with vested interests bleeding City coffers dry. Good Lord, what is up with his face, little Beedee Eyes, Big A$$ Nose and Ears and the hair cut, looks like Burt from Sesame Street.. Good Looking on the lady in the other stall though,, Alot of us dont pay attention to our surroundings, Hate Creepy People…. Haha,he does kind of look like Burt.Maybe that’s his problem. Channel 7 news is calling him the “potty peeper “. The media loves catch phrases and naming criminals. It’s not the police that comes up with names like Night Stalker or Hillside Strangler. Not sure how this jerk makes us infamous. I think it just makes him a jerk. There was a “potty peeper” at a popular restaurant in L.A. They ought to put him in the womens’ section of the jail and let the girls teach him a thing or two.We need a recycler for scum like this. This is only a misdemeanor? I’ll spring for his bail so he and I can remake Bosom Buddies. Haha Adam, you must be very young.It was a sitcom in the 80’s starring a then unknown Tom Hanks.He and his pal had to dress as women . Mr Falcon has a strange sense of humorous. Whoops,that ‘s Falco,like the disgraced football player. OMG,he could be related to the guy who shot the dog-look at those eyes. Just disgusting,good for the observant woman who reported him. You honestly could not make this stuff up.